Would a loving God really give you the power to kill a man by turning him into dust? …It’s Boston, Massachusetts, in 1965, and Father Bill Sullivan is a Roman Catholic priest with a secret – he wields awesome energies he believes are given him by God. 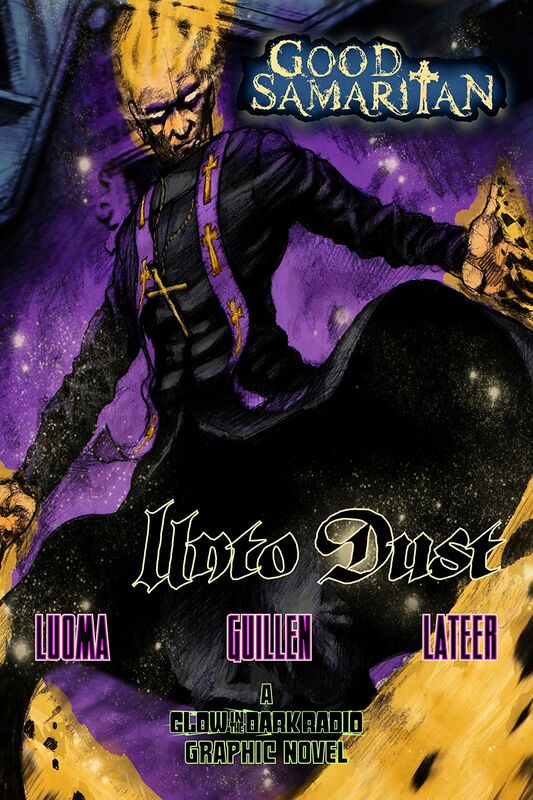 The “Power of the Holy Spirit” manifests around him as nebulous tentacles of purple and gold energy and smoke. The Power allows “Good Samaritan” – as he calls himself – to hover, grab criminals and restrain them, subject thugs to the experience of their own crimes in his “Confessional”, and occasionally render ultimate judgment by turning perps into dust as he proclaims, “Remember Man that thou art DUST and unto dust thou shall return!” A new menace is tangling with Good Samaritan, a creature preying on children. And “normal” life is presenting its own problems as the new Cardinal of the Archdiocese apparently has it in for Father Sullivan! We get thrown straight into the action in this graphic novel (or two-part comic). Bill Sullivan is an interesting character in this story – a Roman Catholic priest with powers from God. The split between his time as a priest and avenger are very interesting, and actually the most of it is him as a priest. He’s either reacting to, or investigating the murders that are happening in his home city! although the ‘action’ parts are very well done, I actually preferred the priestly action. You get a look at his home life, and the toll his dual persona takes on him. on top of that there is the issues of the church – a new Cardinal, a new Pope and new rules! The action is well done, with sweeping panels and dark shadows, there is some really good monster parts too, which add to the threat against the city and to The Samaritan. I really enjoy the art style, it’s very well suited to the style of story, as well as the type of action and adventure we are reading – I especially think it links well to the location. I possibly think that this story could have been stretched well to 3 issues (yes a bigger story) as the speed the final act happens is very fast – although well done. This is a character I could read more of!